We would like you or your organization to help us to spread the word, and let jazz fans know about this event that will take place in our community. 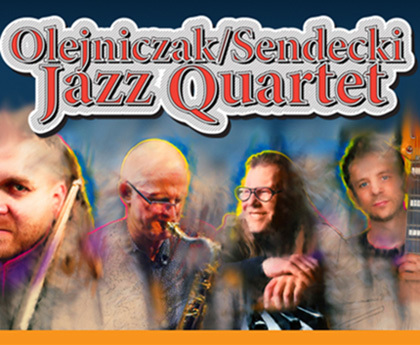 We are very excited to bring to Western Canada Olejniczak/Sendecki Quartet. Leader, Andrzej Olejniczak, residing in Bilbao, Spain, is well known and admired by us, and for occasion of their Canadian tour he is joined by his former team musician, Adzik Sendecki, now residing in Hamburg, Germany. For those of you who remember old Extraball, they both played there, along J.Smietana and others. They will be accompanied by two amazing young jazzmen, already established on Polish and European jazz scene. Extraball vinyl, I emigrated with, has been for me one of the best Polish jazz recordings ever. Unlike last year, we don't have attachment with their recording, as such never happened as yet, we were asked though to record their Vancouver concert. You may listen to their numerous live performances on U-Tube. Copyright © 2014 Polish Canadian Jazz Society. All rights reserved.